Home Equity Rates As Low As 2.49%* APR for up to 36 months when you utilize automatic loan payments through Direct Deposit! 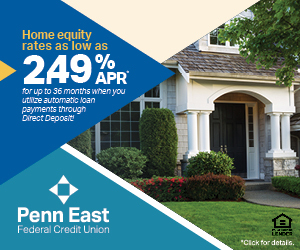 Fill out this form to have a Penn East FCU Loan Officer call you about our Home Equity Loan Sale! Fill out the form above, call us at 570-342-2720 or visit any office location to start your free application today! *APR= Annual Percentage Rate. Loans are for qualified borrowers and the rate given is based on creditworthiness and loan payment through direct deposit. Rates are subjet to change without notice. Minimum Home Equity Loan amout is $1,000, maximum loan amount is 90% of appraisal value less mortgage balance is applicable. Primary PA residences only. Current Penn East FCU loans must include $10,000 new money. Full details available at the credit union.